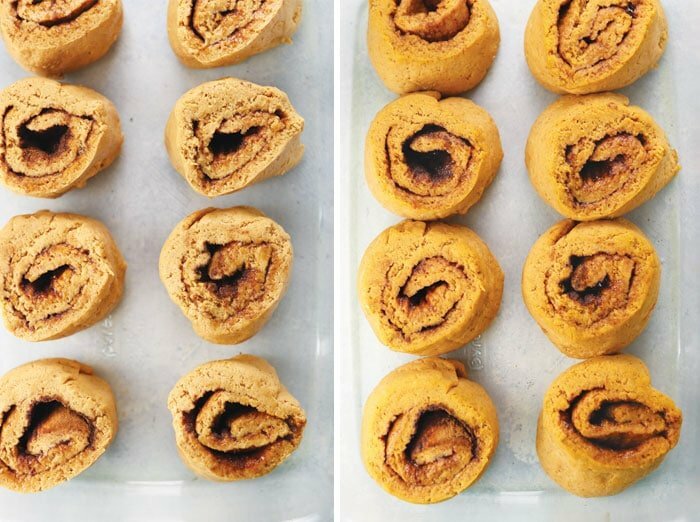 These Gluten-Free Cinnamon Rolls are life-changing. They have a soft and gooey center, and when you top them with your favorite icing, I think they’re totally irresistible. My standards are pretty high when it comes to cinnamon rolls, which is why it took me an embarrassing number of attempts to get these just right. My family has always made Paula Deen’s recipe at Christmas every year, but I wanted to see if I could create gluten-free and vegan cinnamon rolls that resembles hers. I think this recipe is pretty darn close! I tried making my own gluten-free flour blend for my first round of experiments, but I soon discovered that it was WAY easier and more convenient to use a mix that you can simply pick up at the store. 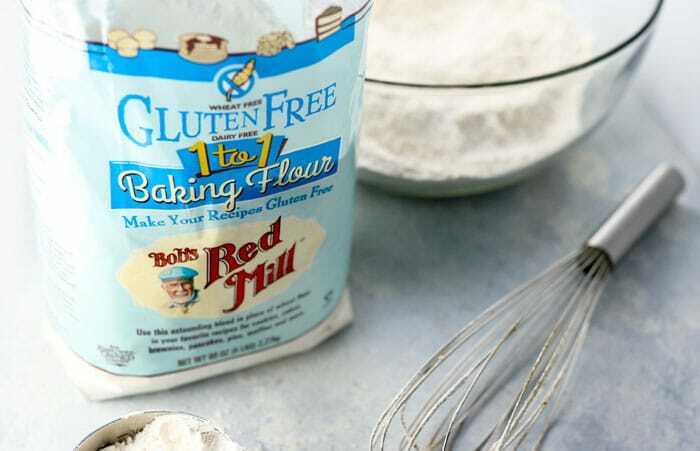 I settled on Bob’s Red Mill 1-to-1 Gluten-Free Baking Flour because it’s available almost everywhere and works really well. If I can find it at my local Target and regular grocery stores here in Kansas, I feel like most people will be able to find it elsewhere, too. I also added some ingredients that you don’t normally see in a traditional cinnamon roll recipe, like ground chia seeds and pumpkin puree. These things greatly improve the texture of the cinnamon rolls, so please try this recipe as written before making any changes. Proof the yeast in a separate bowl. Use warm water and the amount of sugar called for, so that you’ll know if the yeast is active without wasting any of your other ingredients. The water needs to be warm to the touch, like bath water. If it’s too hot or too cold, the yeast won’t rise (and you’ll be left with a yucky yeast flavor). Don’t use too much yeast. I made the mistake of using a whole packet of yeast in this recipe, but it’s not necessary with only 2 1/2 cups of flour– just 1 teaspoon will do, and will help ensure that you don’t wind up with yeasty-flavored cinnamon rolls. Don’t rise in too warm of an area. I thought that it would be a good idea to let my rolls rise in a warm oven (around 110-120ºF), since my kitchen was so cold, but if the yeast rises too fast, it can give your cinnamon rolls a yeast-heavy flavor that isn’t appealing. I still put my rolls in the oven to rise when my kitchen is freezing, but now I make sure it’s closer to 80ºF inside, so it’s more similar to a warm room of your house. You can also simply place the rolls on top of your preheating oven for a warm spot to rise. Try different brands of yeast. I found that Red Star brand worked significantly better for me, compared to Fleischmann’s brand. And please note that this recipe calls for active dry yeast, not the rapid rise or instant version. When pressing out the cinnamon roll dough, be sure to line your countertop with parchment paper (or even plastic wrap), as it will help you roll the dough easily. 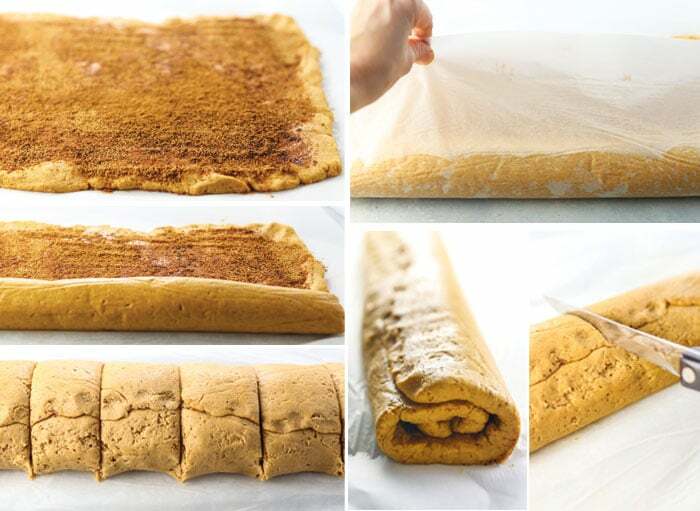 I use this method for making ANY type of cinnamon roll, because I find all the “good” doughs are usually somewhat soft and fragile. Fragile dough = tender cinnamon rolls! A perfect cinnamon roll dough should be slightly sticky to the touch, without being wet. You’ll need to sprinkle a little flour on the top of the dough while pressing it out to help prevent it from sticking to your hands. Don’t be tempted to add too much extra flour to this recipe, as gluten-free flour is very drying and will result in more dense, biscuit-like rolls. Rise Ahead. You can make the dough, roll out the cinnamon rolls and let them rise for 45 to 60 minutes. Then cover and chill in the fridge overnight. When you’re ready to bake them, let them come to room temperature (so your glass pan doesn’t shatter) then bake as directed. Bake Ahead. You can bake these ahead of time and store them in an airtight container in the fridge for up to 3 days. (Don’t frost them yet.) When you’re ready to reheat, bake the rolls at 350ºF until heated through, about 10 minutes. Add the icing once they cool slightly. Can You Make Gluten Free Cinnamon Rolls with No Yeast? Yes, you can. You can leave the yeast out of this recipe and bake them as directed, with more dense results. Keep in mind that yeast makes cinnamon rolls light and fluffy, so when you leave it out the result is more dough-y in texture and the cinnamon rolls won’t rise and spread like you might be used to. However, I think these rolls still taste good without the yeast and you won’t have to worry about all the yeast troubleshooting tips I mentioned above. Just don’t expect a fluffy cinnamon roll when you leave out the yeast. I hope you’ll enjoy these gluten-free and vegan cinnamon rolls for your next special occasion. To keep this recipe nut-free, you can use the powdered sugar icing below (we usually use powdered sugar on Christmas morning! ), or to keep these naturally sweetened, try the Maple Glaze option that you see pictured in this post. 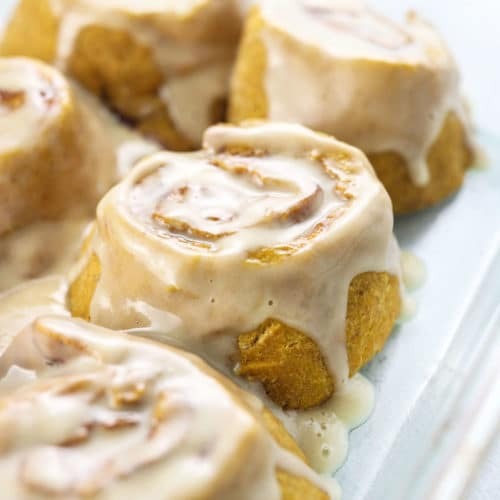 These Gluten-Free Vegan Cinnamon Rolls are light and fluffy, made with Bob's Red Mill Baking Flour. They're totally irresistible! 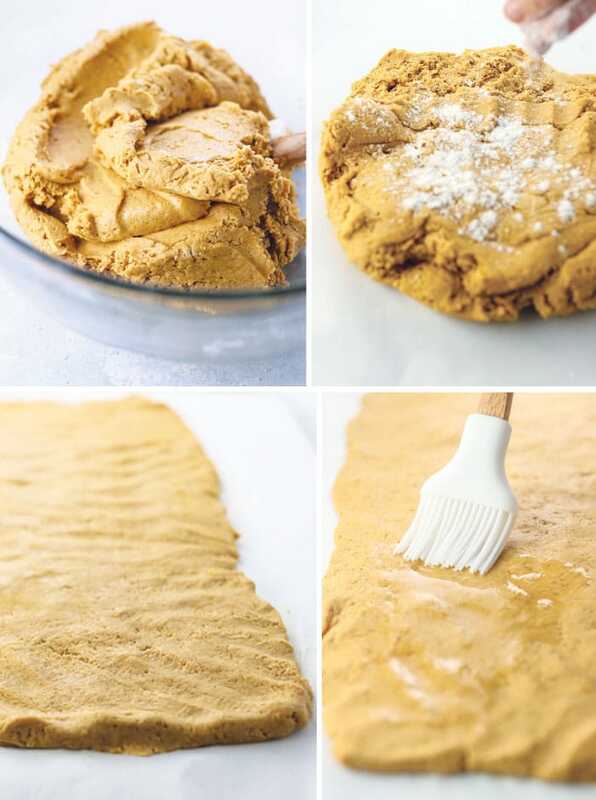 In a large bowl, whisk together the flour, ground chia seeds, sugar, baking powder, baking soda, and salt. Pour the warm liquid from the saucepan into the flour mixture, and add in the apple cider vinegar. Stir well, then add in the yeast mixture. Stir well until a uniform dough is created. It should be slightly sticky to the touch, but not too wet. Line your counter with a large piece of parchment paper and turn the dough out onto the paper. Sprinkle the top of the dough with a tablespoon of flour and use your hands to press out a large rectangle, about 10-inches by 15-inches. Use more flour as needed to press out the dough evenly. Once the rolls have risen, they should be touching. (They won't double in size.) Bake at 350ºF until cooked though, about 25 minutes. If you placed the rolls in a smaller pan, like a cake pan, you might need to bake them for 30 minutes. While you let the rolls cool for 10-15 minutes, prepare the icing. Maple Glaze: Combine the drained cashews, maple syrup, 4 tablespoons of water, and vanilla in a high-speed blender and blend until smooth. Add more water, as needed, to facilitate blending. Powdered Sugar Icing: Combine the sugar, 1 tablespoon of water, vanilla, and salt and stir until smooth. Add more water, as needed, to thin the icing. 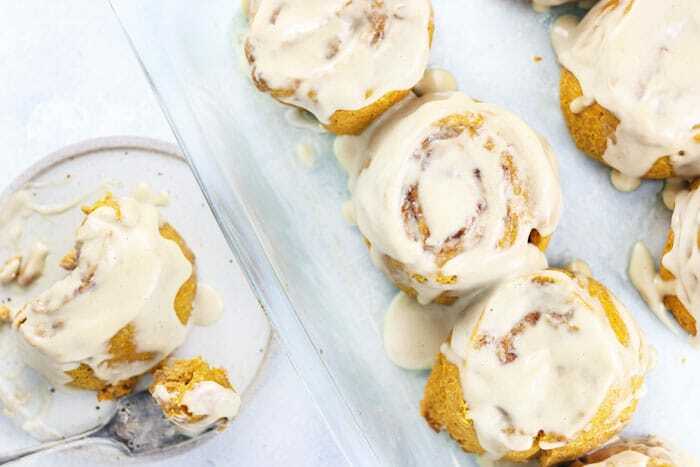 Pour the icing over the warm cinnamon rolls and serve. Leftovers can be stored in an airtight container in the fridge for up to a week, but like most cinnamon rolls, these taste the very best when you serve them the day you make them. If you don’t want to add pumpkin to the recipe, feel free to use water instead. I’ve tested it that way, and it’s fine, but I prefer the texture with the pumpkin. Applesauce or butternut squash puree should work, too, though applesauce will change the flavor and might be noticeable. I have not tested this recipe with other gluten-free flour mixes, so I can’t predict how other blends might work. If you try something else, please leave a comment below letting us know what worked for you. I tried baking several batches in a round cake pan, but I found that the rolls need a longer baking time and have a doughier texture when baked that way. Try baking for at least 30 minutes in a 9-inch cake pan or square pan. 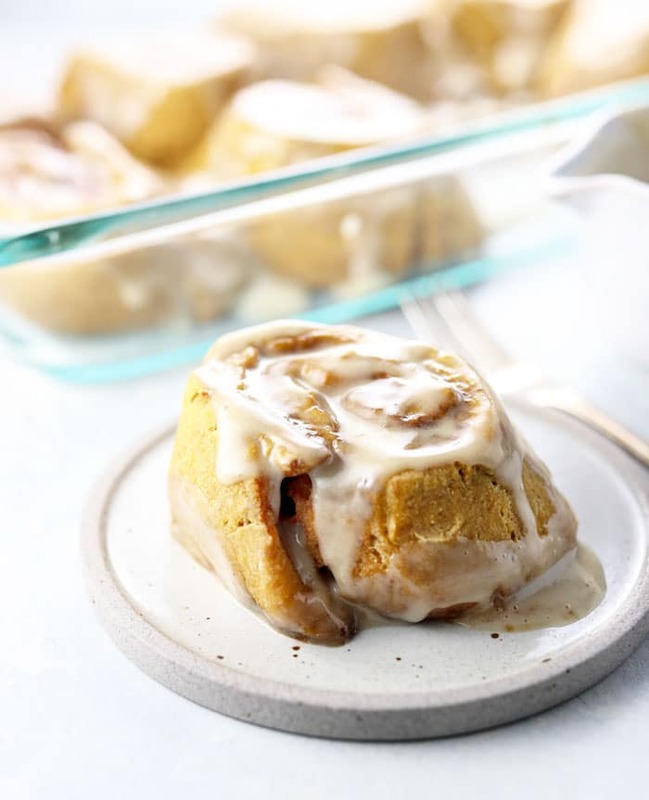 Because these cinnamon rolls are gluten-free and vegan, they do have a slightly different taste and texture from traditional cinnamon rolls. I recommend making a test-batch before making them for a big holiday event, just to make sure YOU like them before attempting to serve them to company! Reader Feedback: Do you have a special holiday treat that you make every year? I’m so excited to test this one on all of my family members this year! Since I’m not vegan, if I wanted to try this with eggs, would I just leave out the water and chia or flax seeds? Or do those ingredients do more than the eggs would do in the recipe? Thank you! This recipe looks perfect for a special occasion breakfast!! I’ve never tried it with an egg, so I couldn’t say for sure. I would probably use only one egg and leave out the flax/chia seeds and most of the water to get started. You might need a little water to help it come together, but I’d wait until the rest is mixed first to see how much you need. Thank you so much for this recipe! I can’t have any oils in my cooking for dietary reasons so I substitute with apple sauce and these cinnamon rolls came out tender, fluffy, and delicious! I have also taken out about half the sugar and added garlic, onion, rosemary powder and nutritional yeast to modify it into a savory dough for Wellington’s! This recipe is a godsend. Do you have a suggested temperature for the warm water to proof the yeast? My family LOVES these and we have spent years looking for the right recipe and this is it! Thank you! BEsides nut, egg, soy and dairy allergies , 2 of my kids are allergic to seeds . Do you think I can just skip it? My dough was way too wet. I couldn’t roll it at all what did I do wrong of how could I have fixed it – any ideas? Thank you! Really delicious rolls with a light, fluffy texture! Yeast intimidates me and the proofing in water is brilliant.Don’t be thrown off by the loose suggestion of 2 tsp of cinnamon – you’ll want to carpet your dough nicely in cinnamon – they are CINNAMON rolls after all! If you want a nut-free alternative for the maple glaze, we did a half cup maple syrup with one tbsp corn starch. Whisk on the stove until blended and starts boiling and then remove from heat and immediately spoon on the warm rolls. Will definitely be making these again! Thanks Megan! Have you ever tried to replace the yeast with greek yogurt (even greek almond yogurt)? No, I haven’t tried that, but let me know if you do! I’d be curious to know if it works. Just tried these today! I got all my ingredients ready to go and made them. Thank you Megan for the recipe, it was easy to follow through and get it done. They were delicious, my hubby loved the gooey middle and was shocked they were vegan and gluten-free. I’ve always been intimated by yeast and was hesitant about making them. Next time I make them I will be putting more attention to my proofing time since I let them proof for an hour in front of my furnace. These taste amazing. Thank you! I’ve come up with my own paleo flour blend using arrowroot starch and coconut flour and xantham. I did try using the yeast in one of my trials and there was no change in the size of the bun. I used Bobs Red Mill yeast and proofed everything properly. Do you think it is my dry mixture that is not allowing it to rise? I’ve also been told that the lack of the gluten elasticity could also be a factor. Coconut flour might keep it from rising because it’s so dense, though GF flours in general don’t rise as much as gluten flour does, either. I tried to include pictures in this post so you could see how much my dough spread during the rising process. They go from not touching in the pan to touching, so they do rise a bit, but not double in size like traditional rolls. Hope that helps! I don’t have it in front of me, but I know it’s not Paleo. They do make a Paleo baking blend, but it’s not a one-for-one substitute for flour in recipes, so you’d have to play around with it! Just made these for 2018. First time ever making cinnamon rolls. We’re not gluten or dairy free but I had to try these. They were absolutely delicious! I don’t miss regular cinnamon rolls at all and i feel better eating them. The kids LOVED them also. I made these for the holidays and I will be making again! thank you! These were easy to make. Tasty. Texture was very mushy, though. Maybe I need to bake them longer, or reduce water / increase flour? To those asking about prepping in advance, bakers will refrigerate dough during a first or second ferment (both sourdough and commercial yeast), in order to slow down its activity (called retarding the dough). I don’t recall the actual chemistry, but the end product usually results in a more complex and flavorful baked good. I’m not sure whether this will translate to gluten-free flour mixes, though? 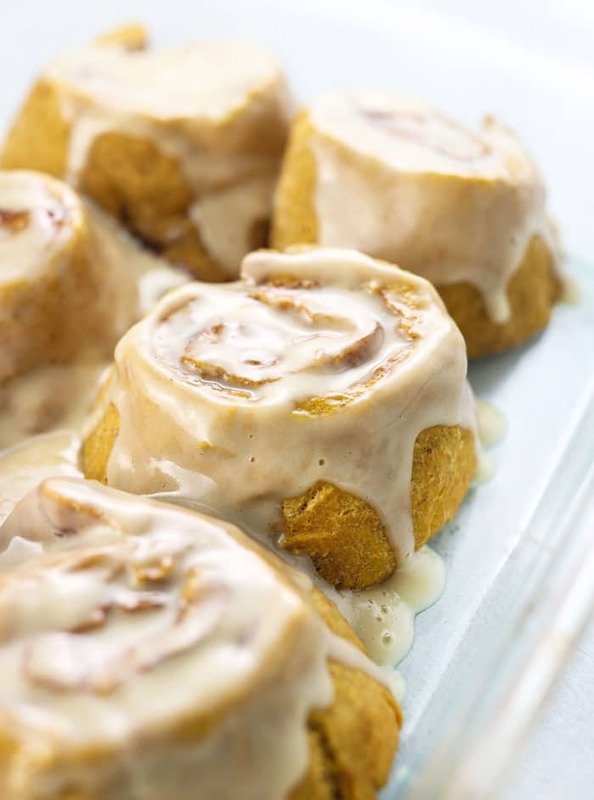 These are wonderful and by far the best gluten free cinnamon rolls we’ve tried! Believe me, we have tried many. We have a Christmas morning tradition and I decided to change up our recipe this year and try yours as it looked promising. My family was hesitant and wasn’t so sure about trying something new. We are all impressed. The doughiness is amazing. Thank you! We will try it again next year but use a vegan cream cheese frosting that we have used in the past. Ignore I’m makingthese ahead of time do I let themselves rise first or put them in the fridge then let them rise before baking that day? Megan explains to let them rise first, then refrigerate. From my long ago experience using yeast I’d say this is best. Let the yeast babies do their work while they are warm. Chilling them will stop the process or at least slow it and I’m not sure they will be as happy after being chilled. I’m not an expert so someone please correct me if I’m wrong. I like to let them rise while the dough is still warm, then refrigerate– otherwise you might have to let them thaw for several hours to help them rise later. Hope that helps! Thank you for this amazing recipe. I love your site so much. It’s so difficult to find refined-sugar-free, vegan, gluten-free dessert recipes. I’m so excited to make this tomorrow. You’re the best, Megan! Happy holidays. Gf cinnamon rolls*, not not rolls. My baby must have pressed some keys lol!